DOLPHINS BELONG IN THE WILD. Dolphins are part of the cetacean family. There are 32 species of dolphin and 4 species of river dolphin. Dolphins eat fish, squid and crustaceans. An adult dolphin eats around 33lbs of fish a day. Dolphins are known for their playful behaviours and are highly intelligent. Killer whales and pilot whales are also part of the dolphin family. Dolphins are known to be very social creatures. Living, hunting and playing together in groups called pods. Dolphin gestation takes around 9 to 17 months depending on species. Calves are known to stay with their mothers from 3 to 8 years. Calves nurse from their mothers for approximately 2 years. Dolphins have good eyesight both in and out of water. The lenses and the cornea in a dolphin’s eyes naturally auto-correct for the difference in the refraction of light underwater and above the surface. 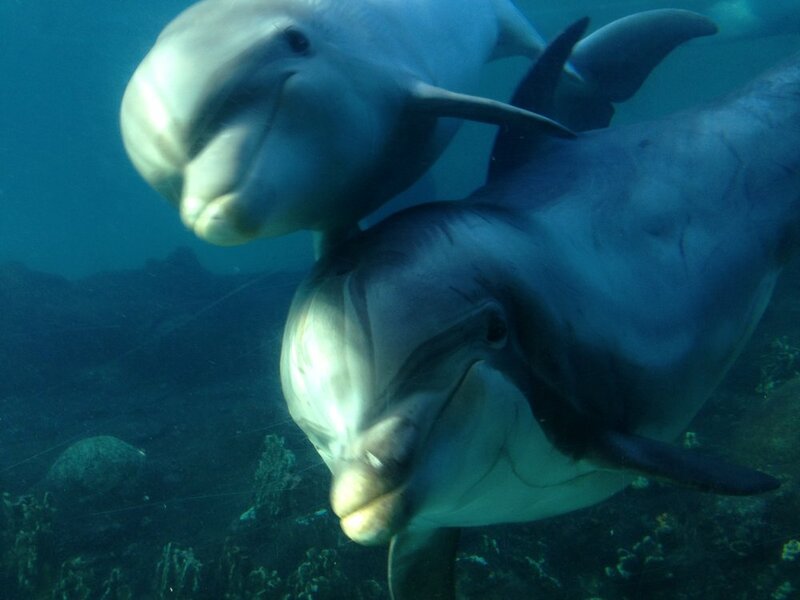 Dolphins have larger brains than humans. Echolocation allows dolphins to “see” by interpreting the echoes of sound waves that bounce off of objects near them in the water. To echolocate objects nearby, dolphins produce high frequency clicks. These sound waves are bounced back to the dolphin after coming into contact with an object. This allows them to identify the object’s location, shape and size. The amount of time for the sound wave to bounce back allows dolphins to determine their distance from the object. They have large complex brains. They are self-aware and create complex languages. They should not be captured and kept in tanks. Many dolphins you see in captivity were caught from the wild during a drive hunt. This involves fishermen in motorboats herding pods of dolphins into shallow water. A few may be chosen for captivity. The remaining dolphins will be slaughtered. Dolphins can travel many miles each day. They use their specially adapted sonar to explore their ever changing environment. They play, swim, hunt and sleep in their family pods. Captive dolphins spend a lot of time between shows languishing in their tanks. Captive dolphins live in sterile environments. Unable to travel or to be with their pod. Scientific evidence illustrates that captivity causes enormous stress, which can result in illness and premature death. Even when dolphins are born in captivity, they are still living in an unnatural environment and not able to live a life similar to that of a wild dolphin. Again causing stress, illnesses and premature death. WHY DOLPHINS IN THE WILD ARE IMPORTANT. Dolphins play an important role in keeping their environment in balance. They eat other animals, mainly fish and squid and are themselves a source of food for some sharks and other creatures. Without dolphins, the animals they prey on would increase in number, and their predators wouldn’t have as much to eat. This would disrupt the natural balance in the food chain and negatively affect other wildlife and the health of the ocean environment. By protecting dolphins we’re helping look after our oceans and that’s good for all the wildlife and billions of people who depend on the sea. WHAT CAN YOU DO TO HELP DOLPHINS? Choose to support eco-friendly wild dolphin and whale tours. Visit virtual interactive dolphin displays. View from land where possible, contact your local shorewatch organisation. In the United Arab Emirates, touch base with the UAE dolphin project.